Concerned about house hunting in Dublin? Our Griffith College Ambassador from Germany, Alissa Nadine Zipp, shares her top tips for navigating the housing market. Finding a place to stay in Dublin can be exhausting, expensive and can easily turn into mission impossible. I’ve been in Dublin for three years now and have already moved three times. Based on my experience I would like to give you some guidelines on how to survive the Irish housing market. Let’s start with the most common types of accommodation in Dublin. Student accommodation is solely for students and located either directly on college campuses or on separate properties. The buildings consist of several apartments with a kitchen, living room and bedrooms meaning you will share the apartment with other students. One of the perks is that student accommodation usually has extra facilities such as laundry rooms, gyms and 24/7 security. You can choose to rent a room either for one semester or one academic year. Living in a shared household means that you live with other people (not necessarily students) together in a private house or apartment. The bedrooms can be either single, double or shared. 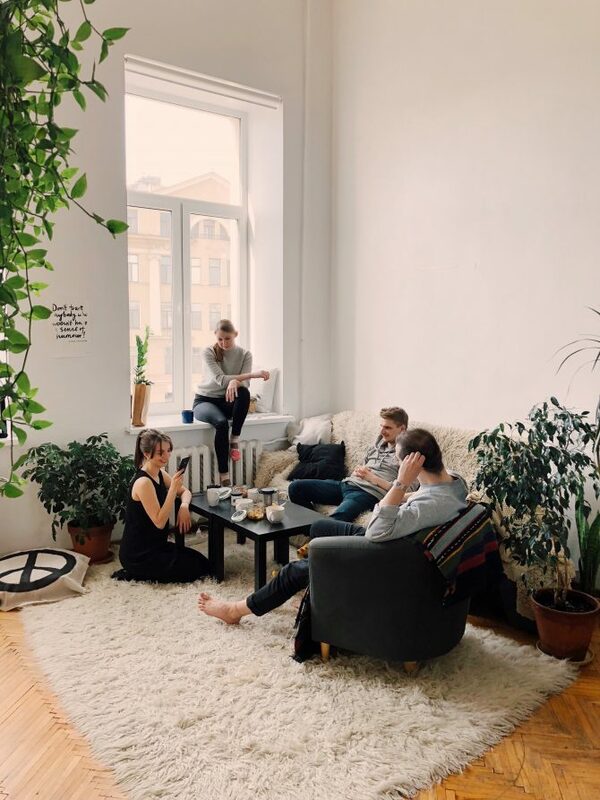 I personally, would recommend that you live in a house share because you always have people around you, and you can build long lasting relationships with people from all around the world. The phrase owner occupied means that you are living in a house or apartment together with the owner of the property. Living with the owner can have advantages and disadvantages. Advantages are that owners tend to maintain their places very well and any issues can be solved straight away. However, living with the owner can also be quite awkward especially when you don’t get along with the person quite well. Also, some people will always make you feel like you’re just a guest in their house and aren’t too fond of you having friends over. When you move in to an owner-occupied place make sure that you get along with the person very well and discuss everything important (e.g. what about visitors?). Prepare a proper cover letter for your application including information about yourself, occupancy, for how long you’d like to rent the place etc. If possible, include previous landlord or work references. The most common website to find accommodation is Daft.ie. Another option is to join Facebook groups such as The Ideal Flatmate Dublin or similar. Keep going my love. Based on my own experience you will end up dropping a hundred emails/messages and only a few will get back to you. It’s frustrating but unfortunately pretty normal in Dublin. Always have money for rent and a deposit or at least for one of those with you in cash when attending a viewing. Sounds ridiculous, I know but people are driven by money. I have been to a lot of viewings where the person who brought along rent and deposit in cash was the one who was offered the room. This doesn’t apply every time but still quite often. Once you found a vacancy and are about to move in, I recommend you get the landlord to sign an official lease or to provide some kind of documentation (e.g. rent books, receipts). The reality, however, looks a bit different. Based on my experience, most of the tenants in Dublin live in accommodation where nothing is documented, and rent paid in cash. The housing market in this city works differently meaning we all have to adapt even if it means taking a risk. Enjoy the challenge of finding a suitable accommodation and most important enjoy Dublin!